The stationery brand made a video similar to Google's doodle depicting its logo change, and tied it back to its own offering of crayons. Google's recent logo change has sparked off varied reactions. While some appreciate the new Sans Serif font, many others find it lacking in appeal. Stationery brand Camlin decided to use Google's logo change to its advantage by sending a congratulatory message to the search giant in the form of a video. To introduce its new logo, Google created a doodle which showed a hand wiping off the 17-year-old logo of the company and sketching a new one, in different coloured chalks or crayons. Kokuyo Camlin decided to associate its colouring crayons with the part where the hand writes the new logo in different colours. Camlin then sent out the video on social networking sites, tagging Google India, with the message - 'If it is crayons, then it must be Camlin'. Saumitra Prasad, chief marketing officer, Kokuyo Camlin, says, "As marketers of Camel, the pioneer and largest brand of crayons, we are delighted to see the new logo of Google inspired by crayons. As Kokuyo Camlin aims to make learning fun for children through its art and stationery products, we are happy to see the world moving towards the same direction, where art and creativity are being encouraged." 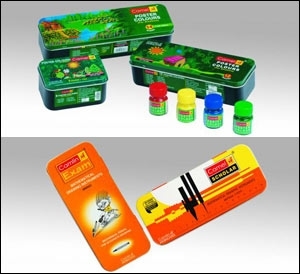 The video, shared on Twitter, expresses how the universal appeal of Camlin's art and stationery products also extends to the virtual world, while highlighting the colourful and interactive look and feel of the new Google logo. Expanding on its core proposition of 'Let's Have Fun', the video also represents Camlin's dedication to helping art lovers bring their imagination to life virtually and create masterpieces sitting anywhere. The video has been created and conceptualised by Kokuyo Camlin's digital agency, Big I Tuna.